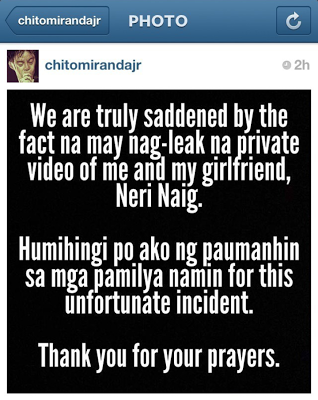 Chito Miranda and Neri Naig are the latest victims of video and photo scandal upload. I first read it in Facebook that there's a certain scandal featuring Chito Miranda but I didn't really care about it until I read it today in the newspapers. Chito Miranda even admitted it in his Twitter account.